Everyone loves a good story, and for today’s conscious consumers, getting to know more about the backstory of the brands and products they buy is increasingly important. Nkatha Gitonga, a Kenyan entrepreneur and founder of Yakutti, is using the power of storytelling to advance the identity of African design. LoA was fascinated to learn more this month from founder Nkatha Gitonga. Yakutti curates uniquely elegant jewelry for trendsetting women to discover chic jewelry and co-design bespoke pieces with ethical eco-conscious jewelry designers and brands that are contributing in significant ways to their local communities and industries. We describe ourselves as a storytelling marketplace for impact-driven jewelry brands of African and African-inspired jewelry. We are interested in advancing our designer partners by facilitating sales and growth, but we are also interested in storytelling because that defines and advances the identity of African design and the design ethics of our designers. 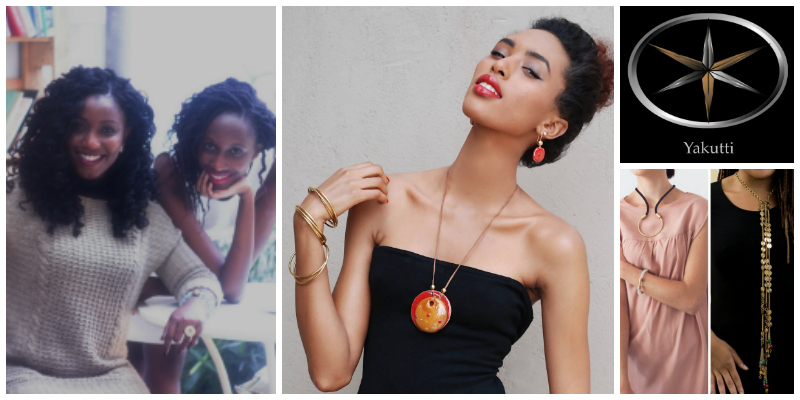 On Yakutti, you will find brands that are working with conservation organizations in Dar es Salaam and designing with upcycled metal in Nairobi; brands that are creating training and employment opportunities for artisans in Nairobi; and brands that are redefining jewelry design in Africa by handcrafting jewelry in unusual materials. "We describe ourselves as a storytelling marketplace for impact-driven jewelry brands of African and African-inspired jewelry." My travels inspired me to start Yakutti. Nairobi, Cape Town, Addis Ababa and many other African cities had growing and beautifully vibrant art and design ecosystems that had such little renown that one had to stumble into them. Yes, popular exhibitions from all over the world displayed work by a handful of internationally-recognized African artists, and businesses solds crafts by unemployed and unnamed African artisans -- these have presently evolved into businesses that sell luxury but still by unnamed African artisans. Stripping African creatives and artisans of their names skews storytelling, and telling only specific stories about artisanal handcrafting pigeonholes African design. Yakutti reimagines narratives about art and design in African and African-inspired spaces within communities, cities and networks. What if people from over the world could access unskewed and diverse stories about creativity and impact from the very designers, artisans, creatives and scholars that were working to advance design in Africa and to complicate interpretations about what an African identity, African art, African fashion and African-inspired design meant? What if this storytelling went beyond a platform to include experiences and travel? Everyone won’t love our jewelry collections. We curate specifically for trendsetting women who love unique accessorizing and believe in responsible purchasing. Our partner designers create passionately and thoughtfully. Our customers buy from us because they are discerning shoppers who appreciate that our meaningful storytelling and thoughtful curation allows them authentic elegance, while affirming their beliefs that our living and purchasing should be socially responsible, eco-conscious, and value-driven. "Yakutti reimagines narratives about art and design in African and African-inspired spaces within communities, cities and networks." Both Mbula Nzuki and I went to a catholic boarding high school in Kenya. We wore grey pleated skirts back then and we would never have known that we loved most things fashion. 5 years and 2 bachelor degrees from the University of Nairobi and from Harvard University later, we would reconnect over our shared fascination for fashion and over our commitment to make a difference. We want to champion jewelry brands that are making a difference, to curate jewelry for women that are making a difference, and to make a difference. We are supported in this vision by two advisors. Margaretta Colangelo, a technology startup veteran with more than 20 years’ experience in product and business development, and Beneah Kombe, a software engineer with a Masters in Computer Science from MIT and more than 6 years’ experience. I didn’t have a policy answer for an educational system that did not fail so many of our students (and I still don’t have one). So, as a college student I competed in the Harvard President’s Innovation Challenge with an idea to build an incubational foundation that would support high school students that did not qualify or afford to join college to build or become part of scalable businesses. My vision was that it would build a strong network of foundation alumni that would pay it forward by donating finances, mentoring and training back to the foundation. The Innovation Challenge’s judges praised the solution but faulted its sustainability model. Nonetheless participating had opened me up to the ideation process and to its potential for problem solving. I took a couple of entrepreneurship-related courses at the Harvard School of Engineering and Applied Sciences, I joined the Harambe Entrepreneur Alliance and connected with inspirational African dreamers that believed the world was changeable, and over my senior fall semester, sat on my college bed and coded up Yakutti’s first website iteration! In the short term, we are recruiting more impact-driven designers in order to grow our partner designers’ network. We are also designing storytelling and experiential initiatives that will highlight our partner designers’ impact and stories and allow our discerning customers to not just buy elegant jewelry, but to also participate in the creative process, attend popup events, and even contribute to the impactful work our partner designers are involved in. In the long term, we are aiming to champion more systemic solutions for challenges within the African design space, for instance, skills training in emerging technologies, financing support, and co-manufacturing spaces for our partner designers. "We want to champion jewelry brands that are making a difference, to curate jewelry for women that are making a difference, and to make a difference." I won’t be able to define satisfaction for myself until some of our deepest commitments - tremendous growth by our partner designers, systemic industry solutions - are underway. So right now, I have appreciation for the little things - the customer that loves her jewelry, the designer that makes a sale, the people that believe in and support us. Further, I have anticipation for the bigger things we are planning. Get started now. That sounded pithy and perfect, but to more usefully state it, start as soon as you have an idea or a solution you are passionate about. You could always use more experience, more savings, better skills, but nothing teaches you entrepreneurship like actually having to ideate, test product-market fit, refine a value proposition, and run a startup. I am yet to meet an entrepreneur, or read about one, that was fully prepared for the challenges of running a business. Most success stories are defined by grit and adaptability, so equip yourself with these, and get to it.